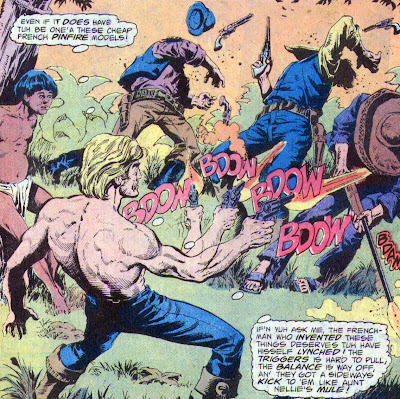 Matching Dragoons: Jonah Hex #18 "Amazon Treasure... Amazon Death!" 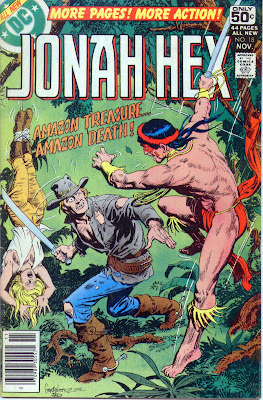 Jonah Hex #18 "Amazon Treasure... Amazon Death!" Michael Fleisher, story - Val Mayerik & Danny Bulanadi, art - Jose Luis Garcia Lopez & Luis Dominguez, cover. Surprisingly, Jonah Hex is still in South America, the Amazon River to be exact and he is still paddling the canoe that he used last issue to escape from the cannibals. Jonah hears a scream and pulls over to the bank of the river to investigate. He finds five men threatening a native boy with what looks like a hot poker of some kind. Jonah throws a knife into one man's chest, uses the canoe paddle to smash one guy upside the head and then grabs a dropped pistol. He then guns down the three remaining men while giving a running commentary on the downside of using a 'cheap French pinfire model'. Jonah then cuts the boy loose from the tree. A native man is watching from high up in another tree and uses a blowgun to put a poison dart into Jonah's shoulder. Staggering from the poison, Jonah staggers back to the canoe and launches it into the river. Unconscious, Jonah floats downriver (probably back the way he came since he came from the ocean) and, of course, goes over a pretty small waterfall and washes up on the bank. A couple of men fond Jonah and take him to a large plantation. There, they turn him over to a woman they address as Miss Vanessa. The text tells us that Jonah is out for weeks until one day he wakes up, with Vanessa at his side. Vanessa calls for her brother, Paul Venal, the owner of the large rubber plantation. Venal explains to Jonah that he was found along the river with a curare dart in his shoulder. Venal tells Jonah that the dart was made by the Kre-Ena-Krore tribe. The poison is a fast acting type and that it takes an unusual man to survive it. Jonah tells them about being on a sailing ship that sunk. Venal offers to show Jonah around the plantation but offers to lend Jonah a revolver. As they enter the library, Jonah spies a pair of ivory-handled Colt .44 Dragoons hanging on the wall. Venal compliments Jonah on his knowledge of weapons and asks if he is a collector or if he uses guns in his work. Jonah says that it's something like that. Several hours later, Venal and Jonah are admiring the view of Venal's property. Venal states that it is getting late and that they need to head back, night brings forth roving bands of bandits. Sure enough, before they can get back to their horses, they are stopped by four men who announce, in Spanish, that they plan to rob Jonah & Venal. Jonah tells Venal "Muh Spanish never wuz fluent, Mr. Venal, but you speak the lingo real good, dont'cha?" 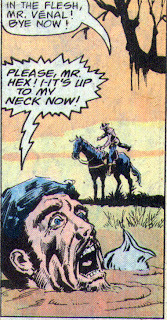 Jonah Hex isn't fluent in Spanish? 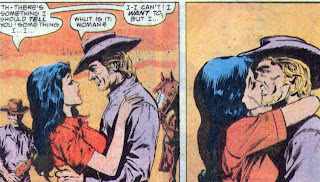 And I suppose Anita Blake is written by Shakespeare. But, back to the impending carnage. Jonah tells Venal to tell the robbers that he is about to shoot all of their gold teeth out. Venal translates, not exactly, but politely and the robbers bust up laughing and then the 'greatest grand master of the sixgun the world has ever known' drops all four of the bandits like gum from a gumball machine. Later, back at the plantation, Venal details the adventure to Vanessa and explains that he plans on using Jonah to locate the hidden treasure of the Kre-Ena-Krore. Venal had sent five other men to locate the treasure and they never came back. Venal plans on tells Jonah that he will be sent on a rescue mission to find those men and then will move in after Jonah has slaughtered the tribe. The next day Jonah sets out on the 'rescue mission' along with about a dozen men and Vanessa. For three days the group cuts their way through the jungle and Jonah is starting to get suspiscious. He's been drawing comparisons between the five men they will rescue and the five men that Jonah killed several weeks prior. During a rest stop, Vanessa gets attacked by a python. Jonah stops a man from shooting the snake to keep the natives from hearing the shot. He grabs an axe and throws it to cut the snakes head off. Vanessa throws the snake carcass off of her and runs into Jonah's arms. The band continues on into dusk. They have encountered a quicksand pool and one of the men starts to walk around it. Jonah notices that the ground has been dug up but suddenly the man falls through teh ground and into a spiked pit trap. Jonah orders the men to retrieve the body, sink it into the quicksand and then reset the trap so that the natives don't know that the trap has been sprung. Once darkness falls, Jonah orders everyone that there will be no fires, they eat and set camp in the dark. One bellyacher decides to light up his pipe and gets an arrow in the chest for his efforts. Jonah pulls his knife and goes after the native. Jonah manages to catch him and kill him but there is another native that escapes into the night. Later Vanessa is begging Jonah to turn back and she spills the beans about Venal and the treasure. Vanessa begs Jonah to get them away from there and to take her with him, but they are suddenly surrounded by natives. Jonah starts to put up a fight but gets knocked out (!?!?!). When Jonah comes to, he is tied to a stake, one of many in a line, in the center of the native village. Several men are already dead, large spears run through them. Right before Jonah is going to get speared, the young boy that Jonah saved earlier recognizes Jonah. The chief orders Jonah freed and starts talking to Jonah with sign language. Jonah realizes that it isn't too much different from the sign language he knows. The chief tells Jonah that he wants to give Jonah the tribal treasure. Jonah goes into a large lodge and sees that the treasure of the tribe is a pile of shrunken heads!! The chief hands Jonah a small bag that contains the head of Vanessa. Jonah decides he better take it and is then sent on his way. Jonah rides for quite a ways until he comes to the quicksand pool. He stops and rolls himself a cigarette because he is expecting Venal to show up soon. Jonah isn't wrong because shortly Venal and two of his men arrive. Venal greets Hex and Jonah tells him that everything he has been looking for is in the small sack. Venal is surprised but sends his henchmen to get the sack. They start towards Jonah but they end up falling into the pit trap. Venal grabs his rifle, and avoiding the pit, he heads toward Jonah. Jonah tosses the sack toward Venal, but Venal suddenly realizes that he is stuck in the quicksand. He starts begging Jonah to save him, offering to split the treasure, no, he'll give Jonah everything. Jonah tells Venal that he can keep it. Venal opens up the sack, sees that it is Vanessa and then slips beneath the sand, screaming for help. Jonah rides off for parts unknown. Men killed by Jonah: 13. He knifes 2, hits one with a canoe paddle, shoots 7, lures 2 into a pit trap and lures 1 into quicksand. Jonah's injuries: Falls over a waterfall, knocked in the head, and gets a curare poison dart. Timeline: This is a continuation of last issue, but we have no indication if this is prior or after the Hex fugitive storyline. Next Issue: International intrigue and dynamite death. 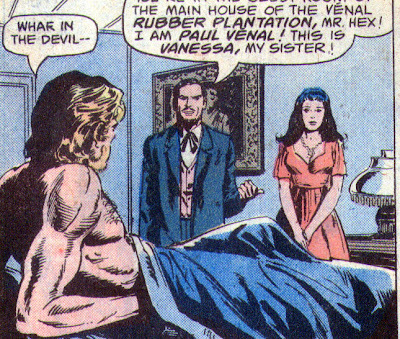 Well, with a name like Venal, I was pretty sure that he was a bad guy. I haven't read this before, but it actually sounds like a pretty good yarn. Oh, those wacky Amazon natives and their treasure! Too bad for Vanessa...but she DID kiss Jonah, who apparently has as potent a Kiss of Death as Kyle Rayner.